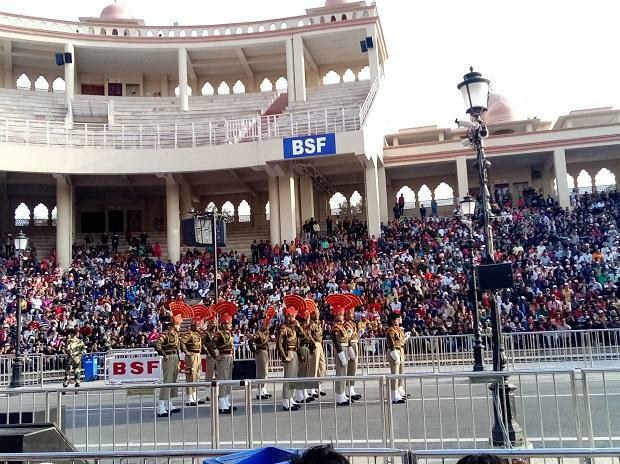 'Please don't raise slogans other than Bharat Mata ki Jai, Hindustan Zindabaad and Vande Mataram,' the parade anchor repeatedly cautions the audience which has gathered to witness the beating retreat ceremony at Wagah-Attari. Emotions run high among all those who have gathered here. On any other day, one would expect intense patriotism and a little bit of anger at Pakistan. Not today. It has not been a week since a suicide bomber rammed a vehicle laden with explosives into a convoy of paramilitary personnel. The blood of the 40 soldiers, who might have been sharing wisecracks one moment and were blown up the next, hasn't dried. When a group of youngsters hurls expletives at Pakistan, a Border Security Force (BSF) jawan raps them. "Is this why you guys have gathered here?" he reprimands in a bada bhai tone. Most of us are confused what our response should be. On a usual day, middle-aged elders in the crowd would have taken exception to the youngsters. Perhaps, sneered at them if not asked them to behave. But today they seem to be unsure if Pakistan doesn't deserve a mouthful. After the attack, one which Sachin Tendulkar, who never sledged back no matter however nasty the opposition got, called 'dastardly', the generally well-behaved Indian has been at a loss, searching for ways to chip away at the enemy - - on social media and chai shops alike. For the last half an hour, the sun has been troubling us. Curious members of the audience try hard to shield their eyes against the sun with their hands and look across the gates. They want to know what's happening on the other side of the border. Geography intends a pun at this site. The sun rises in India, the east, and sets in Pakistan, the west. 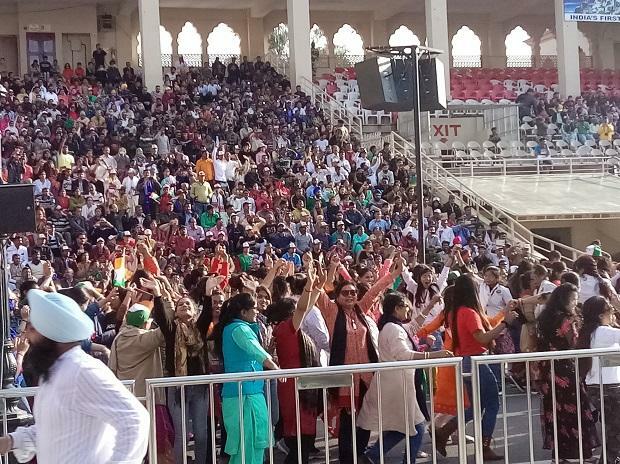 A jawan invites women members of the audience to the parade track to dance to patriotic songs. Ladies make a beeline and flood the 25-30 yards wide stage. The crowd has ceased shifting in their seats. We sing along and cheer the volunteers. A R Rahman's Oscar winning 'Jai Ho' entices those seated to shake a leg and break a jig. When 'Suno gaur se duniya walon, buri nazarna hum pe daalo' plays, some members of the troupe change their stance from the audience - facing to Pakistan - facing. We cheer them loud enough to send the message across. How does a civilian who wants to participate in India's response do his bit? Prime Minister Narendra Modi said in the aftermath of the bombing that he understands the 'deshkeliyekuchkarguzarne ki ichha'. The desire to play one's part for the cause of the nation. At the Hague, where a former Indian navy officer accused of spying by Pakistan is fighting his execution, an Indian diplomat snubbed a Pakistani official by folding hands in a 'namaste' when greeted with a handshake. On social media, the diplomat won many hearts - - offering fellow countrymen a symbol, and a sample of, telling Pakistan how hurt by the latest act of terrorism Indians are. The ladies are back to their seats. The parade starts, led by two women soldiers. A speaker is blaring with commands. The parade anchor goads the audience to raise their decibels. In the following half an hour, we see a regular beating retreat episode. Perhaps, the patriotic slogans are a bit more intense today. The heaviness in the jawans' hearts may have descended down to their feet, resulting in a harder thumping. Towards the end of the routine, is a customary shaking of hands between the Indian commandant and his Pakistani counterpart. It happens. The symbolism of the drawing out of the two pairs of white-gloved hands and the hand shake is too fast for a crowd at a distance to notice, or react to. 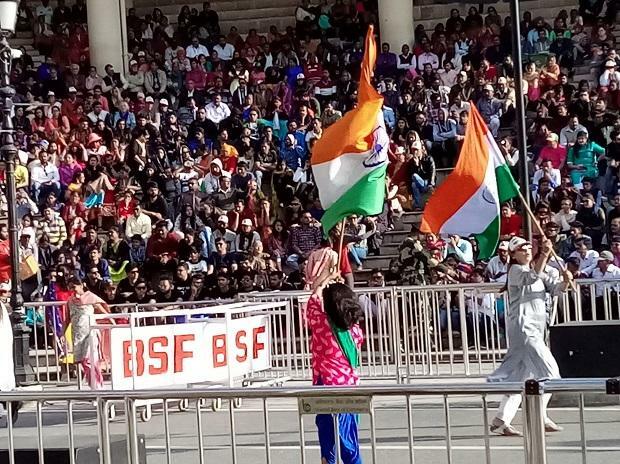 As the ceremony comes to an end, a BSF jawan tells the crowd to disperse from the amphitheatre and leave it clean. The unruly youngters have once again resumed anti-Pakistan slogans. 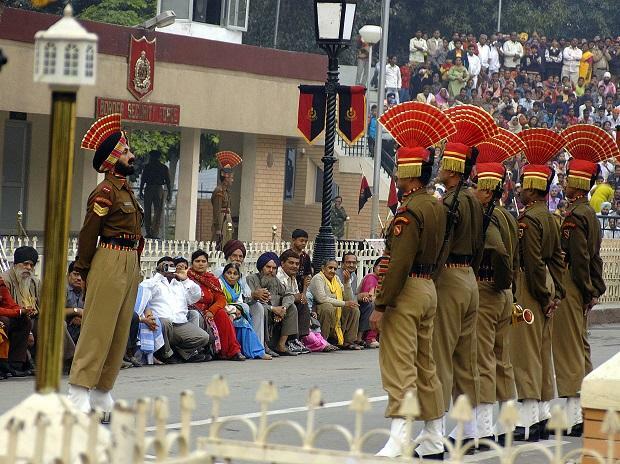 A jawan tells them to stop and leave. They shout a couple of slogans in praise of Maharashtra and Shivaji, and then click selfies. While at the final exit, after crossing two or three gates named 'Exit', I try to strike a conversation with a jawan. "Do you think there might be a war?" I ask. He gives me a disconcerted look and says "We will do our duty".